H2RM is a multilingual integrated software solution for Advanced Enterprise Risk Management developed in cloud computing, ensuring 24x7x360 availability (with access anywhere and anytime via the Internet), so there is no need to install programs or invest in infrastructure for data storage. 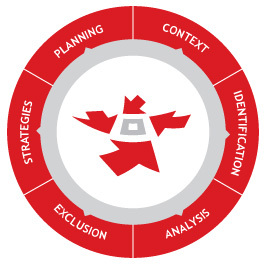 H2RM allows you to integrate and manage information about risks, offering elements to aid the decision making process (Risks Map, causes and consequences, Risks Matrix, frequency and severity), while allowing access to the risks knowledge database. It dynamically controls the implementation of mitigation measures while providing its comparison with the Risk Matrix, measuring its progress or deviations in face of the risk tolerance. The use of H2RM is appropriate since the design phase, construction/installation and operation, and you can still use it at various organizational levels (global, department, project, process or system), being available in Portuguese and English.